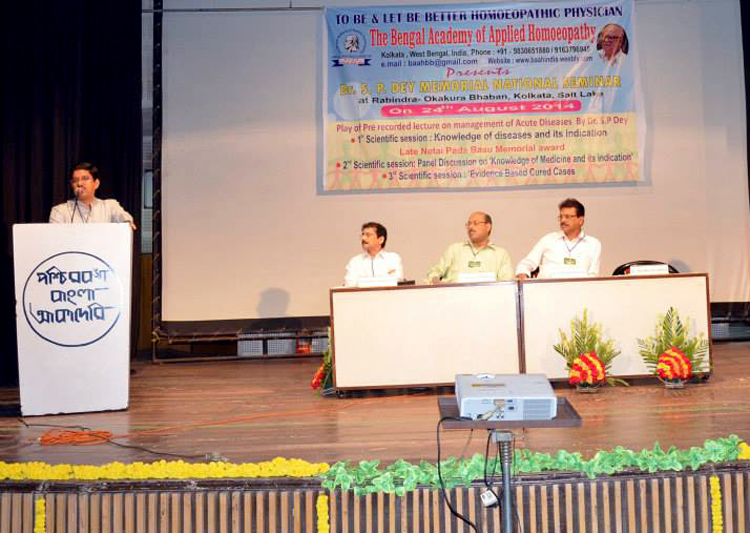 KOLKATA.AUG.24: The Bengal Academy of Applied Homoeopathy [BAAH] has organized Dr. S.P Dey Memorial One Day BAAH National Seminar -2014 at Rabindra-Okakaura Bhavan Salt Lake, Kolkata. Dr. Sushanta Banerje, Director of Medical Education, Govt. of West Bengal inaugurated the seminar. Dr.Shubhankar Bhatacharyjya, Executive Director, Airport Authority of India was the Chief Guest and Dr. Shyaml Mukherje, Secretary General HMAI was Guest of Honour. Dr. Biswajit Basu, BAAH Chairman welcomed the gathering. In the inaugural session BAAH Souvenir was released and organization web site was also launched.In this year Late Netai Pada Basu Memorial award was given to Nisha Ganguly, who stood first in Final BHMS Exam, under WBUHS in the year 2013. A pre-recorded speech on ‘Management of Acute Diseases’ given by Dr S.P Dey in the first seminar was played to pay tribute to the great departed soul. In the first session, Dr.Soumendu Adhikary and Dr. Rajat Chatterje shared their experiences on ‘Knowledge of Diseases and its indication” elaborately. Dr. Biswait Basu illustrated his topic on ‘Phenomenological Aspect of knowledge of diseases’ with a live case of chronic liver diseases with oesophageal Varices and video clip follow up of a known Alzimer’s disease. A panel discusion was presented with presence of Dr. Biplab Kundu and Dr. Pradip Bairi on Knowledge of Medicine. In the concluding session BAAH study circle members Dr. Alok Ghosh and Dr. Debojyoti Dawn presented evidence based cases with investigation reports and photographs. The seminar was concluded with vote of thanks by BAAH Secretary Dr. Shipra Basu.